Before you know it, Christmas will be here! For me it's kind of a denial thing...............every year I say that I am going to get started on my Christmas cards early........every year its the SAME OLD THING! Come August, I start to think if I start my cards now, I can work at a leisurely pace to get my cards done and wouldn't it be COOL to give everyone a unique card........could be done, if I started in JANUARY!!!! Well, here we are almost into November and once again I don't have any cards completed. In fact the norm is that I go into a stamping frenzy around the 15th of December (long after the cards should have been mailed), ink flying off the pad, sweat on my brow, trying to produce enough Christmas cards for my friends and family!!!! If I am lucky, I have just enough for everyone and don't have to go to the store and (ohhh cover your eyes if this part it too horrible.........almost makes ME shiver!) buy cards to send! But Alas!!! This year, I have a head start! I have ONE card completed. Yep...........this one!!!! I made this card for the October Hanna Release. The image is from the Vintage Toys collection. I masked out the little Soldiers (it required three images of the solider stamped onto a post it note). 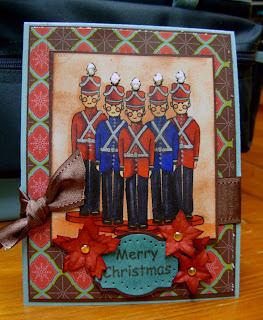 The soldiers were then coloured with Copic Markers, the background sponged in with Creamy Caramel. Once assembled, I filled in the straps with Silver Gel Pen and added Liquid Applique to the Soldiers hat. All paper is from Stamping up: Baja Breeze, SU! Christmas paper and Chocolate Chip. The wide Satin Ribbon and Brads are also from SU! The paper poinsettias.........well I forget. Short term memory seems to fail me!!! So if you want to prevent Christmas card anxiety........you best get crackin' on those festive creations! I am thankful for the sun on my face and the wind in my hair. I am thankful for the clean air that I breath and the fresh water I drink. I am thankful that I live a life that, in comparison to many other people in the world, is relatively stress free. I am thankful that I have been blessed with good friends and loyal family. I am thankful that I have one child to love and a heart that has proven to mend itself together when fragile or broken. I am Thankful That I can Throw my head back towards the heavens and give thanks........that I can see all the beauty on the earth, that I have a brain to process through the ugly and for ears that can drink in all the wondrous sounds of the world. I wish all my Canadian friends a peaceful Thanksgiving. Take some time to reflect on the things that you are thankful for. Then look toward the heavens and smile. 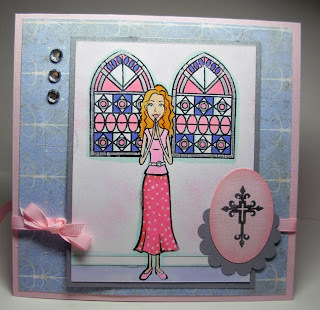 I coloured this card for the colour Challenge on Splitcoast Stampers last Tuesday, but I didn't get around to finishing it. Last night, loaded down with Turkey and feeling like I might explode, I plopped my Lazy Bahookie into my Ultra Comfy Office Chair (oh YES!!! I am very thankful for that!!!) and finished this card. This sweet image is Cabbage Rose, available at STAMPOTIQUE. In addition, the sentiment and blades of grass are also available there..........just follow the link in my sidebar! I Love it when Jonathon gets a hankering to stamp. It doesn't happen often anymore, but when it does, I take full advantage!!! He is particularly fond of colouring Riley's, which is perfectly all right by me........................... It allows me to painlessly put some cards together. I used the Copic airbrush system to do the snow layer. What fun that is!!!!!! A new cuttlebug background, some stampin up! Flower embellies and a white gel pen for SNOW!!!!!! Thanks Jon, for all your help!!!!!!! Wasn't the release party a blast last night??? 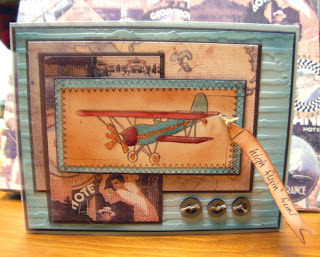 Today is Friday Challenge Day over in the Hanna Stamps Member Forum and I am the Hostess with the Mostess!!!!!! lol.......... Gosh, sometimes I think I sound like I am a legend in my own mind! Anyway, the challenge today is Pretty in Pink. To create a card that incorporates the colour Pink. It's funny that I chose this colour, because pink happens to be one of my LEAST favourite colours! But then again, that is a challenge! To work with a colour that you are not particularly fussy for. If you know me, my wardrobe is Black, Brown, Black, some prints, Black............well you get it. A couple of years ago in a moment of temporary insanity, I purchased a pink cotton summer outfit..............Pastel Pink at that!!!! I wore the damned thing to work and you would not believe the attention I got...................I got so many "you look pretty in pink" that when I got home, I immediately donated the thing to my Mother...............sheesh..............pretty in pink.........what was up with that!!!!!! Anyway, head on over to the Member Forum and play the challenge today. We have a little reward for our players. Everyone who plays the Friday Challenges will have the chance to win a Hanna Stamp set at the next release party. Play the challenge 4 Fridays and you will get 4 chances to win!!!!!! 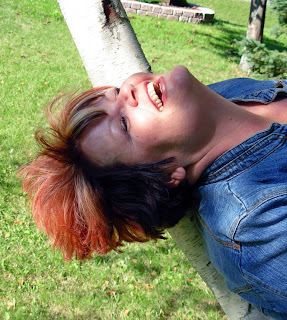 Thanks to all of you for your comments on the blog this week and supporting Hanna Stamps! We couldn't do it without you!!!!!!! 9. I ENJOY the dizzy feeling that I get trying to stay on top of the posts.. can you say head spins? 8. It means that I will SURELY be too busy to cook dinner........yep, Takeout Tonight! answer my favourite method of foot pampering, will win a sweet surprise from me!). 6. It will be THURSDAY NIGHT.....that means I am ONE DAY closer to the weekend........YEAH! lips, I LOVE to see all the samples that the Design Team shares ! dishes can wait!!!!! can't they??? Well until they start looking like a science experiment! else have a just turned 12 year old with size 14 feet???? AND THE NUMBER ONE REASON I CAN"T WAIT FOR THE HANNA RELEASE WEEKEND? So see you HERE Tonight at 9 p.m. EST!!!!! And here is the Heat embossing card I promised. 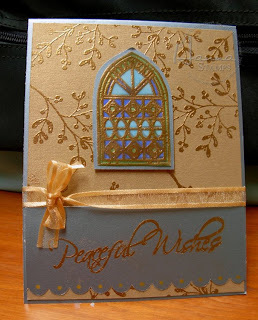 The image is from For the Soul, the Background and Sentiments from Peaceful Wishes-Stampin' UP! I'd rather be juggling Snowballs!!!!!! These little penguins are so playful!!!!! Wouldn't you rather be juggling snowballs, or GIANT Maltballs for that matter.........hmmmm nope............. definitely not GIANT Maltballs...... they'd probably melt faster than the snowballs, but then again, they'd get eaten up before they melted!!!! Anyhow, my point is that snowballs or maltballs would be more fun to juggle than trying to prioritize and juggle all the tasks that we have to complete in our careers, relationships and as parents or caregivers or friends..........It's nice to take some time for ourselves. If you are here visiting, kudo's to you for just doing that! I am sure, like me it is relaxing just to blog surf. This sweet little image is from the Penguin Antics set, that will be released THIS Thursday night at the Hanna Stamps release party!!!!! Oh and if you want to win a yet to be seen Riley or Sophie image, you know what to do!!!!!! 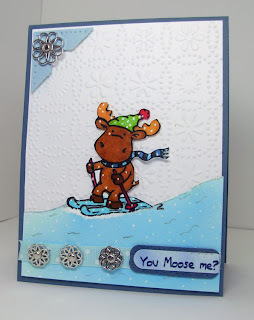 Today's prize challenge is to create a card using embossing............dry or heat. 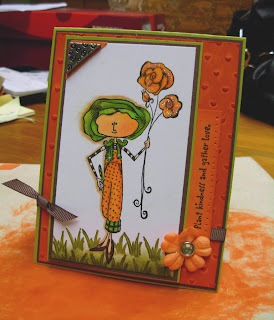 I have another card that I created with Heat embossing, but just coudln't get the picture quite the way I wanted. Embossing is easier than juggling maltballs when you use the Cuttlebug Embossing templates......... 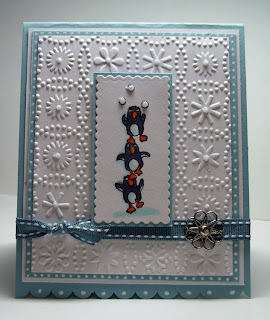 I used the new Baha Breeze Paper to create this card, along with white and Blue Bayou Ribbon. The pretty silver flower is from Stampin' Up!!!!!!!!! Have a great day and good luck on winning one of the new images! Don't forget to Blog Hop to increase your chances!